Permalink	Mighty No. 2868 Shujinko Sat, 2015-09-26 13:16. Permalink	Mighty No. 67897 Zero Sat, 2015-09-26 14:04. Permalink	Mighty No. 10555 Sat, 2015-09-26 12:51. I downloaded the demo after using the "request Humble Bundle orders" feature on the Humble Bundle site. I'm at the $99 tier. Overall I'm pretty happy with the game. Thanks to Comcept for finally getting the demo out there. My main criticism: everything seems very shiny in the game -- including Dr. White's afro. It's... odd. Permalink	Mighty No. 61876 GeorgeCdA Sat, 2015-09-26 11:35. I downloaded the demo. Since I already had a humble bundle account and used the same email address for kickstarter, I found the demo under the 'non claimed purchases' part of my account (https://www.humblebundle.com/home/purchases). But now I am unable to run it. 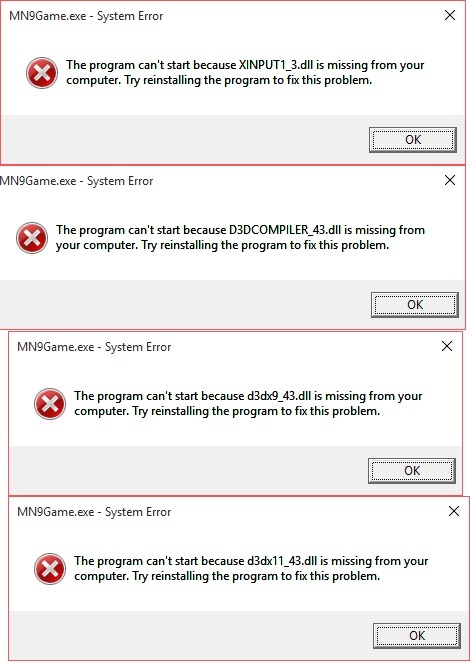 It says is missing the files XINPUT1_3.dll, X3DAudio1_7.dll, D3DCOMPILER_43.dll, XAPOFX1_5.dll. What now? Running Windows 10 Home. Permalink	Mighty No. 54219 Bill Sun, 2015-09-27 09:39. I hope this helps someone else. I finally got the demo working - search for DirectX End-User Runtimes - I used the "June 2010" version. Note - after I installed this I got further errors and I had to install Microsoft Visual C++ 2010. After that the demo worked. Loving the game so far! It's a blast. Permalink	Mighty No. 63423 Akinori II Sat, 2015-09-26 19:09. Permalink	Mighty No. 67897 Zero Sat, 2015-09-26 12:35. Have you checked that you have installed directX 9? (as far I've seen this is the version the game is running), also check that the file was fully downloaded or decompressed, use the md5 checksum that is at the side of the download link and download a tool to make the check. Permalink	Mighty No. 19725 Sat, 2015-09-26 12:34. Same problem here, Windows 10 with DirectX 12 installed (checked in dxdiag). Permalink	Mighty No. 67897 Zero Sat, 2015-09-26 12:37. Permalink	Mighty No. 23025 Zech Sun, 2015-09-27 00:43. Direct X9 can not be installed on Windows 7+, which is what everyone runs. Permalink	Mighty No. 5308 Cold Machine Sat, 2015-09-26 11:29. I probably missed this in another announcement, but am I right in assuming that defeating bosses doesn't give you their ability in this demo version? Am I missing something? Permalink	Mighty No. 3543 Sat, 2015-09-26 07:34. Yeah I thought the demo is supposed to be for all backers. Is that not the case? This is what happens when I click on Mighty No 9 (5$) tier on my purchases page on HumbleBundle. Am I doing something wrong or just missing the download link? I've looked thoroughly and I do not see it. Furthermore, I thought they announced many months ago that ALL backers will get the game for free along with pretty much all the dlc. I mean I even filled out the platform survey for which version of the game I want to receive. Permalink	Mighty No. 63423 Akinori II Sun, 2015-09-27 15:46.
did you Pick the 5$ Support amount?? Permalink	Mighty No. 5308 Cold Machine Sat, 2015-09-26 11:38. They must have meant all backers who pledged for the actual game. It'd be silly if all the people who pledged $20 did so for nothing if they could have pledged $5 for the game and still get it. Still, demo access wouldn't have hurt. Permalink	Mighty No. 68933 Sat, 2015-09-26 07:19. My Mighty No 9 page on Humble Bundle is blank. What's the deal? Permalink	Mighty No. 46317 Lifeman Sat, 2015-09-26 07:18. Has anyone successfully redeemed the demo? I can't find it. Is the demo for a specific tier of pledgers? I mean, I don't have a good PC in the first place, but I still want to redeem the demo for the future. Permalink	Mighty No. 59359 Roc Sat, 2015-09-26 07:20. Yeah, I've redeemed it and got it downloading; you need to use the Order Resender link and make sure your email is the one you used on kickstarter. Put that email in and check that email - you should have a message from Humble Bundle, that will take you to a page to redeem the game. Hope this helps! Permalink	Mighty No. 46317 Lifeman Sat, 2015-09-26 07:30. It still isn't there. I get the message "When available, you'll be able to get all your digital content listed below right here on your download page!" Sounds like a TON of other people are having this problem as well. Permalink	Mighty No. 68933 Sat, 2015-09-26 07:28. Permalink	Mighty No. 70001 X-shunin Sat, 2015-09-26 07:04. I can't download the demo. I even used the resend feature and it only shows me the physical tier of MN09. But no demo for me.